Social media and latest mobile gadgets are just perfect tools for sharing any kind of useful information with customers—fashion and beauty brands know this too well. While sharing advice via Facebook, Instagram or Pinterest is already a must for any beauty brand, the question is how exactly they are marketing their branded content within the digital space. Scroll down to discover 8 latest original and progressive takes on teaching and promoting beauty& style. The online retailer has launched a personalized shopping experience around the #OOTD (“outfit of the day”) hashtag. As part of The Next OOTD effort the company encourages Instagram users to share their selfies with the correspondent hashtag and get a personalized shopping recommendation inspired by their looks from Zappos in return. Saks Fifth Avenue has launched a series of beauty tips packed in a bit-size six-second format of a Vine clip. The #Saksin6 vignettes come as make-up tutorials highlighting select beauty products and revealing how to apply them quickly and nicely. 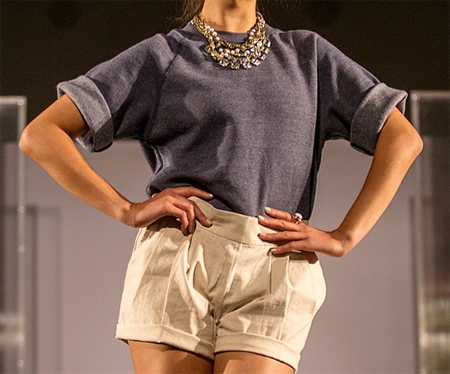 The luxury chain has posted 11 super short videos that can also be viewed on YouTube. In early 2014, L’Oreal USA professional hair care and hair color brand Matrix announced the Matrix Class for Glass program that would leverage the power of Google Glass to teach hair-dresses how to create awesome styles. The wearable device becomes a powerful tool of a three-phase initiative that will include Blogger Video Series, The Matrix Eye for Style Google Glass Salon Chair as well as a salon professional education platform. The first-ever Professional Google Glass App will be released in late spring, featuring loads of related content that will be available for both customers and professionals. The Dolce & Gabbana fashion house has revealed a series of tutorials, explaining ladies how to create perfect looks for any occasion. The dedicated section on the official website features a simple but detailed guide on how to recreate 2014 Spring Collection look, Monica Bellucci looks from the latest D&G advertising campaign, and more. The tutorials include video tips as well as a palette with recommendations on how to match key products, developing a perfect make-up. 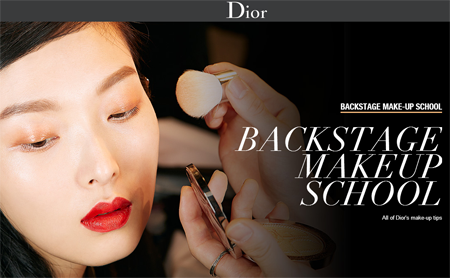 Dior has opened the Backstage Makeup School online to zoom in every detail of application secrets. The dedicated site features trends, basics and timeless techniques, visualized with short videos centered around one of the secrets, as well as expert tips on choosing a shade or product. The videos are minimalistic, featuring the model and the product that is being applied by an off-screen hand. Plus, the brand shares understanding of the true value of make-up. The launch of the online school is dedicated to the release of Backstage Pros’ Instant. In summer 2013, L’Oreal signed a partnership with Michelle Phan, a YouTube popular makeup vlogger, for a line of makeup products. The development of the line was also coordinated with the audience—Michelle discussed the palette and features of the upcoming range with the community and also met some of her fans to get their professional insights. In early February, Marc Jacobs launched an unorthodox campaign to promote a new Daisy fragrance, luring fans to communicate with the symbol of the campaign, a white daisy. The brand gave away Marc Jacobs-branded gifts like perfume, necklaces and purses in a pop-up store in Manhattan in exchange for tweets, Instagram photos and Facebook posts featuring fans posing with the campaign’s symbol, the white flower. Users were encouraged to share the related content with the hashtag #MJDaisyChain. Former Starbucks executive Jane Park launched a start-up that produces vibrant and somewhat eccentric nail-polishes, now with the help of masses. The platform invites fans to crowdfund new products, helping them hit the shelves as soon as possible. In early year, the team raised more than $140,000 to fund the production of an innovative nail polishing tool, and they also collected valuable feedback to drive the product to perfection. Posted in Marketing, Social Media and tagged cosmetics & perfumes, Digit, Dior, Dolce & Gabbana, Facebook, Google Glass, Instagram, L’Oréal, Marc Jacobs, social media, Twitter, Vine, Zappos. Bookmark the permalink.